A complimentary breakfast free Wi-Fi indoor pool hot tub and sauna are just a few reasons our guests sing the praises of La Quinta Inn & Suites Belgrade / Bozeman Airport. The three-story La Quinta offers 65 rooms that include free Wi-Fi microwaves mini-fridges and coffeemakers. Days here start with hot waffles at the hotel's complimentary breakfast. When night falls enjoy fresh-baked cookies in the lobby. The indoor pool hot tub and sauna provide body-warming relaxation after a day of hiking or skiing in the surrounding mountains. 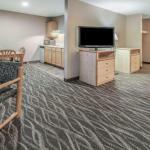 You'll also find a fitness room on-site plus a business center and guest laundry. Pets are welcome. Parking is free. Non-smoking accommodations are available. La Quinta is off I-90 three miles from Bozeman Yellowstone International Airport (Gallatin Field). It's less than two hours from the West Yellowstone entrance of Yellowstone National Park. You'll find a few restaurants within a half-mile of the hotel. Downtown Bozeman with a wide selection of local restaurants and brew pubs is a 10-mile drive. Skiers can rip up the slopes of Bridger Bowl Ski Area 25 miles away or Big Sky Ski Resort 50 miles away. The Museum of the Rockies 12 miles from the hotel is home to some of the most famous dinosaur specimens in the world. Dogs of all sizes are allowed. There are no additional pet fees. Dogs may not be left unattended, and they must be leashed and cleaned up after.